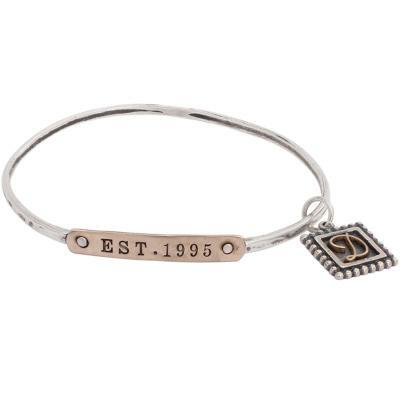 "Personalized Bangle silver and Gold, Established Bracelet"
This custom bangle bracelet has style. The Established Beloved Bracelet reminds you of the date your life changed forever. It is so simple yet meaningful. Mix the metals and stack them together to create your own look! What year did it all begin? Your family was established the day you were married, engaged or dedicated yourself to one another. Commemorate the special year with the Established Beloved Bangle. We love the versatility of the metals ~ you can decide which best fits your style! The bracelets can be ordered in four different metal combinations of bronze and silver. Personalize with the year you were engaged, married or became a parent or grandparent. Or put in the date of an event that changed your life and established who you are today ~ such as a sobriety date or cancer free date. You can add a Postage Stamp Letter for $14 for your first or last initial. The bracelet is stamped in our block font and you can put up to 4 numbers in the customization box. The price listed is for one bronze/bronze bracelet. If you choose a different metal combination the price will increase. Dimensions: Large - Approx. 8.25" around. Small - Approx. 7.75" around. The cuff piece is approx 3mm wide and the stamped nameplate is approx. 1.25" x 1.25" and can be stamped with up to 12 characters/spaces.